Festivities for adults and kids, including costume contests, parades and free jello shots! When we first visited Belize, more for a way to renew our 180 day temporary permit in Mexico than anything, we went to Caye Caulker. While there, we discovered that certain parts of the country celebrate our favorite holiday in the US…Halloween! At the time, we never suspected we’d still be here months later. 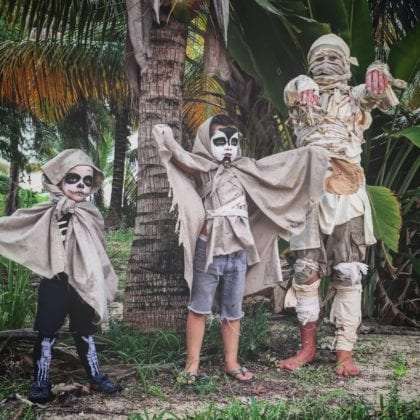 So when we returned to Belize a few months later, and fell in love with the little fishing village of Placencia, only to find out that town really went all out for Halloween, we decided to extend our one month permit to a second month in order to take advantage. And we’re so glad that we did. Halloween in Placencia was an absolute blast. The community came together to throw a weekend long bash that was better than what we’ve seen in most of the United States. One bar is reggae music, the other thumping DJ beats. You can stand on the beach and watch both at the same time, they’re literally right next door to one another. While a few adult partygoers just got dressed up in their nicest clothes and danced all night long, the majority of town coming out on the town that night were full on into the Halloween spirit with costumes galore. The adults had their fun on Saturday night, but as Halloween actually fell on the following Monday, the kids went out the day of (something I really appreciate…so often in the US we do Halloween on the most convenient day, instead of the actual day). A scheduled parade from the pier, through town, and back to the Tipsy Tuna ended up getting cancelled after we all stood in the rain–hoping it would stop as it became more and more torrential. Everyone just ran on their own terms to the bar that would play host to adults sipping beverages while the kids participated in a costume contest. One hundred kids showed up. Three trophies were handed out (seriously, trophies?!) and everyone got a ton of candy. A ton. After the contest, and with the adults a couple beverages in, the kids were able to walk around town, knocking on doors, doing the real, old fashioned trick or treating thing. Yet more candy was had, to every child’s delight. Plenty of houses in Belize are wooden shack style, so once you toss some spiderwebs and a few scary grown ups around the yard, the atmosphere really picks up…and the lightning that replaced the rain brought it all together. Where we were previously worried about how we’d participate in the Dia de Muertos celebrations in Mexico, instead we ended up with one of the best Halloweens ever. Not that we wouldn’t love to try out Dia de Muertos at some point in life, but for our little ones (and their dad) who get really psyched on this particular holiday, it couldn’t have been better. Curious about Halloween for yourself? Stop in, email or call the Tradewinds beachside cabanas and ask for more information, I’m sure they’ll be happy to help! Get free kayak rentals with an affordable stay at the Tradewinds cabanas in Placencia, Belize. Taking advantage of the off season in Belize to enjoy a slower, more affordable tropical paradise.